In the first game from ROKiT Field at StubHub Center since Week 5, the Chargers fell 23-22 Sunday to the Denver Broncos. Broncos kicker Brandon McManus made a 34-yard field goal as time expired to end the Chargers' six-game winning streak. Running back Melvin Gordon totaled 156 yards – his sixth-straight game with at least 120 yards from scrimmage. Quarterback Philip Rivers finished 28-of-43 for 401 yards, two touchdowns and two interceptions. Rivers has thrown at least two touchdowns in every game this season. It wasn't enough, though, to overcome two turnovers and 14 penalties. Defensive end Joey Bosa added a quarterback hit and a tackle in his 2018 debut. After forcing a three-and-out to start the game, the Chargers’ offense put together a 13-play, 49-yard drive that included a pair of third-down catches by wide receiver Keenan Allen. Michael Badgley’s 46-yard field goal gave Los Angeles an early 3-0 lead. Philip Rivers throws the ball during the Week 11 matchup against the Denver Broncos from ROKiT Field at StubHub Center. Keenan Allen runs after catching a pass from Philip Rivers during the Week 11 matchup against the Denver Broncos from ROKiT Field at StubHub Center. Antonio Gates and Melvin Gordon slaps hands during the Week 11 matchup against the Denver Broncos from ROKiT Field at StubHub Center. Rayshawn Jenkins tackles Adam Jones on a kickoff return during the Week 11 matchup against the Denver Broncos from ROKiT Field at StubHub Center. Geremy Davis and Rayshawn Jenkins celebrate Jenkins' stop during the Week 11 matchup against the Denver Broncos from ROKiT Field at StubHub Center. Damion Square celebrates tackling Case Keenum during the Week 11 matchup against the Denver Broncos from ROKiT Field at StubHub Center. Melvin Gordon runs the ball downfield during the Week 11 matchup against the Denver Broncos from ROKiT Field at StubHub Center. Mike Williams celebrates a catch during the Week 11 matchup against the Denver Broncos from ROKiT Field at StubHub Center. Derek Watt runs up the middle during the Week 11 matchup against the Denver Broncos from ROKiT Field at StubHub Center. Virgil Green celebrates catching a pass from Philip Rivers during the Week 11 matchup against the Denver Broncos from ROKiT Field at StubHub Center. Antonio Green runs after catching a pass from Philip Rivers during the Week 11 matchup against the Denver Broncos from ROKiT Field at StubHub Center. Tyrell Williams and Antonio Gates celebrate Gates' long catch during the Week 11 matchup against the Denver Broncos from ROKiT Field at StubHub Center. Jatavis Brown tackles Phillip Lindsay during the Week 11 matchup against the Denver Broncos from ROKiT Field at StubHub Center. Desmond King and Jahleel Addae jump in celebration during the Week 11 matchup against the Denver Broncos from ROKiT Field at StubHub Center. Denver Broncos running back Phillip Lindsay is tackled by Joey Bosa during the first half of an NFL football game Sunday, Nov. 18, 2018, in Carson, Calif.
Keenan Allen celebrates during the first half of an NFL football game against the Denver Broncos Sunday, Nov. 18, 2018, in Carson, Calif.
Travis Benjamin breaks away from Denver Broncos cornerback Isaac Yiadom during the first half of an NFL football game Sunday, Nov. 18, 2018, in Carson, Calif.
Austin Ekeler pushes away Denver Broncos inside linebacker Josey Jewell during the second half of an NFL football game Sunday, Nov. 18, 2018, in Carson, Calif.
Melvin Gordon runs downfield during the Week 11 matchup against the Denver Broncos from ROKiT Field at StubHub Center. Mike Williams catches a pass over Tramaine Brock during the first half of an NFL football game Sunday, Nov. 18, 2018, in Carson, Calif.
Mike Williams celebrates his leaping catch during the Week 11 matchup against the Denver Broncos from ROKiT Field at StubHub Center. Keenan Allen catches a touchdown pass during the first half of an NFL football game Sunday, Nov. 18, 2018, in Carson, Calif.
Keenan Allen celebrates his touchdown during the Week 11 matchup against the Denver Broncos from ROKiT Field at StubHub Center. Austin Ekeler runs downfield while Philip Rivers blocks for him during the Week 11 matchup against the Denver Broncos from ROKiT Field at StubHub Center. Melvin Gordon runs the ball during the Week 11 matchup against the Denver Broncos from ROKiT Field at StubHub Center. Antonio Gates jumps up to catch a pass from Philip Rivers for a touchdown during the Week 11 matchup against the Denver Broncos from ROKiT Field at StubHub Center. Antonio Gates catches a touchdown pass over Denver Broncos inside linebacker Josey Jewell during the second half of an NFL football game Sunday, Nov. 18, 2018, in Carson, Calif.
Antonio Gates celebrates his touchdown catch during the Week 11 matchup against the Denver Broncos from ROKiT Field at StubHub Center. The Bolts celebrate Antonio Gates' touchdown during the Week 11 matchup against the Denver Broncos from ROKiT Field at StubHub Center. Philip Rivers and Antonio Gates jog off the field after Gates' touchdown during the Week 11 matchup against the Denver Broncos from ROKiT Field at StubHub Center. Michael Badgley kicks a field goal during the Week 11 matchup against the Denver Broncos from ROKiT Field at StubHub Center. The Bolts celebrate Michael Badgley's field goal during the Week 11 matchup against the Denver Broncos from ROKiT Field at StubHub Center. Antonio Gates turns to run after catching a pass from Philip Rivers during the Week 11 matchup against the Denver Broncos from ROKiT Field at StubHub Center. Antonio Gates and Philip Rivers slap hands on the field during the Week 11 matchup against the Denver Broncos from ROKiT Field at StubHub Center. 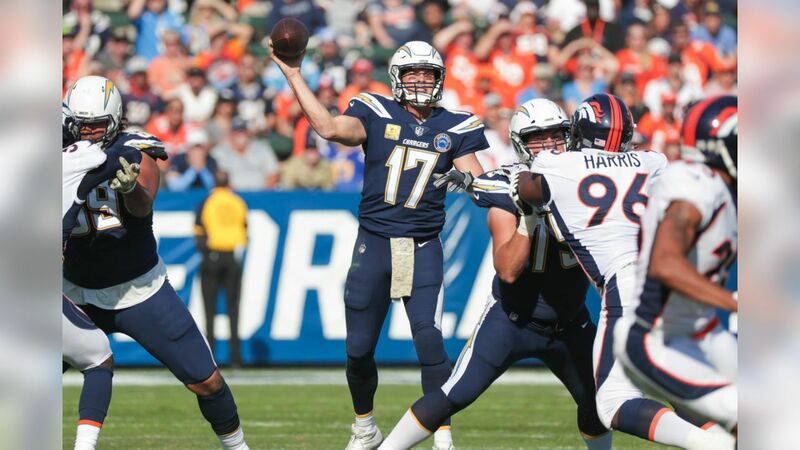 The Bolts’ defense forced another fourth down when Bosa chased down quarterback Case Keenum, causing him to throw an incomplete pass while running out of bounds. Denver held the ball for just 4:09 of the opening quarter. Rivers connected with five different receivers for 121 yards in the first quarter, but the Chargers committed seven penalties for 50 yards. They led 6-0 after Badgley’s second field goal of the day – this one from 45-yards out. The Broncos took the lead when undrafted rookie running back Phillip Lindsay raced 41 yards for the team’s first score of the day. The touchdown was aided by a fake punt that kept Denver’s drive alive. Down a point with the Broncos again on the move, Los Angeles’ red zone defense buckled down just like it has the last two weeks. Facing a fourth-and-one on their 16-yard line, the Chargers stuffed Lindsay for no gain to take over on downs. That’s when momentum swung back to the Bolts. Gordon reset the tone with an effort-laced 32-yard catch-and-run packed with broken tackles that gave Los Angeles the ball at Denver’s 39-yard line. Two plays later, Rivers hit wide receiver Mike Williams for a 29-yard reception. Allen capped off the nine-play, 81-yard drive with a four-yard touchdown reception – his second in as many weeks. Los Angeles lead 13-7 at halftime. The Chargers added to their lead to start the second half with a nine-play, 75-yard drive that ended with Rivers to tight end Antonio Gates for a six-yard touchdown reception. Badgley’s extra point was no good. It was his first missed kick of the season. The Broncos responded with 13 unanswered points. Their first score was set up by a Von Miller interception and a 42-yard return to the Chargers' 18-yard line. A three-yard Royce Freeman touchdown cut Los Angeles' lead to 19-14. Denver's second score of the half was set up by a 39-yard catch-and-run by rookie wide receiver Courtland Sutton. A two-yard touchdown rush by Lindsay gave the Broncos a 20-19 lead after their two-point conversion failed. On its next possession, Los Angeles regained the lead 22-20 with an eight-play, 60-yard drive ending in a 30-yard Badgley field goal. The next score of the game would be McManus' game winner. The Chargers will host the Arizona Cardinals in Week 12. Kickoff from ROKiT Field at StubHub Center is on Sunday, Nov. 25 at 1:05 p.m. Pacific (Fox).